Cornelia Street off Bleecker has a trove of great restaurants – Pearl Oyster Bar (where I had my first lobster roll), Cornelia Street Cafe, Le Gigot, Home Restaurant (a brunch favorite with killer oyster po’boys and duck confit butternut hash). 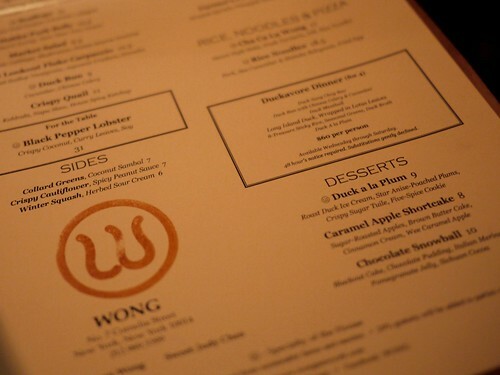 The newest of these gems is Wong, by Simpson Wong, whose cuisine can only really be described as Asian fusion. Unlike typical notions of fusion, however, the food here is not as contrived at all and familiar Asian dishes are delivered with unique flair. Sorry in advance for the very dimly lit, awkwardly tinted photos. The restaurant was extremely dark, even by 5:30pm, and our candle gave everything a reddish glow. 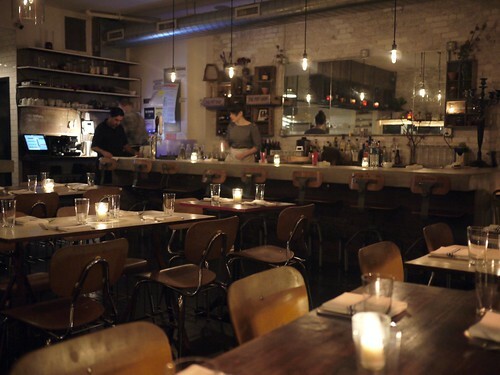 The interior is much like any other casual dining place nowadays, minimalist with classroom-style chairs, open kitchen so you can see the chef working on your dishes, and a long, wooden bar where patrons can sip Asian-inspired cocktails while waiting for their table. 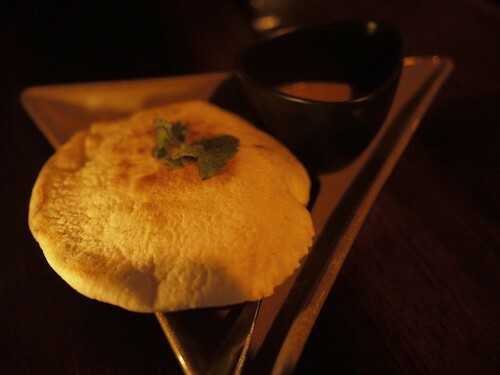 The waiter first brought us some curry with paneer and naan, the restaurant’s version of bread and butter. 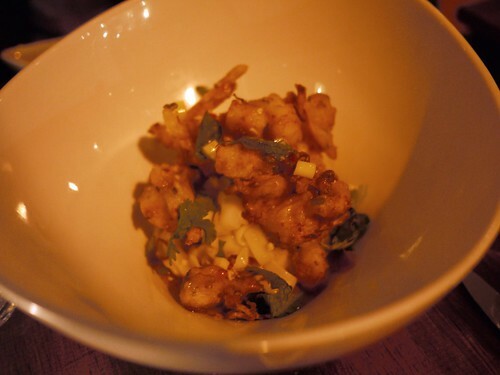 The flavors in this little dish were incredibly sharp, and it bode well for the rest of the meal. Our starter were the house specialty, Wong’s duck buns, with cucumber and chinese celery. I wasn’t sure how I’d feel about the herbal taste of Chinese celery in what I’d assume would be a fatty bun (akin to Momofuku’s pork belly buns) but we ordered them anyway since they were one of the better known dishes and we weren’t disappointed. The celery definitely added an earthy element, balanced against the fatty, tender duck. 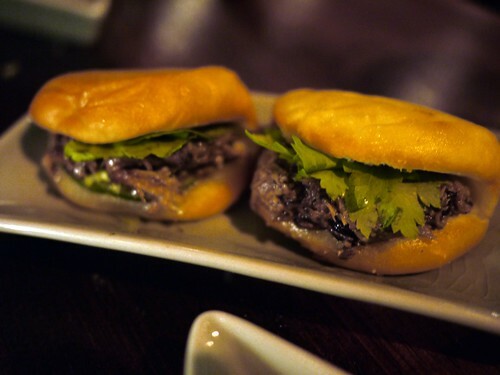 The buns were also crisply fried, which was a very nice and unexpected touch. Initially, we also wanted to try the Hakka pork belly small plate, served with turnip, taro root tater tots (I wanted the dish for this alone), and greens, but the kitchen had sadly run out so we got the shrimp fritters instead. Normally, I don’t like foods that are too tart, and this dish had a really bracing, acidic vinaigrette (no doubt nam pla played a part) poured on everything else immediately before eating. It was a bit shocking for my taste buds at first, but as we continued to mix the sauce with the noodles and fried shrimp, the flavors began to meld together and harmonize with one another. Our shared main course was a real show-stopper, Wong’s egg foo young. I’ve never actually had regular egg foo young before, so I had no base of comparison, but this was perfect in so many ways. 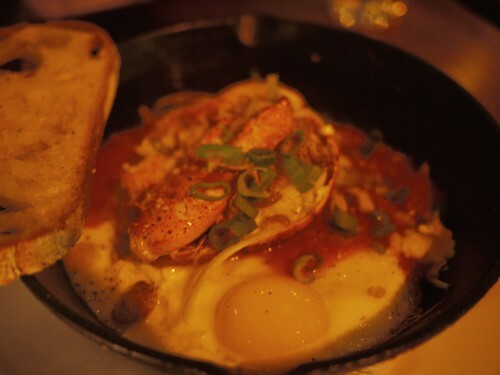 The day’d been extremely cold and we had basically walked the length of Bleecker Street, so to dig into such an insanely comforting, egg-yolk-and-lobster-filled dish was a real treat. Add crumbled salted duck-egg yolks (which my family goes absolutely nuts about), and we were mopping the last scraps up with whatever bread there was left. We didn’t get to try the famous duck fat ice cream (served with poached plums, tuile, and 5-spice cookie) since we were worried it’d be too much rich food but picked up some gelato from Grom on the way back, though in retrospect I suppose Grom ice cream isn’t that much less indulgent than duck fat ice cream. Mandarin and torroncino (nougat) for me, pear and cassata Siciliana (almond chips, candied lemons and oranges) for Laura. 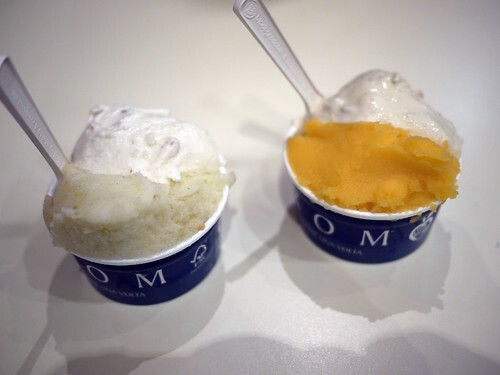 aw this place looks great!i’m so into your blog!i can’t help browsing almost every posts you wrote!what’s more,they totally bring back my sweet memory when i was in nyc.you’re lucky to be around there!there’re just tons of restaurants to choose! You are currently reading Wong + Grom at Notes on Food.